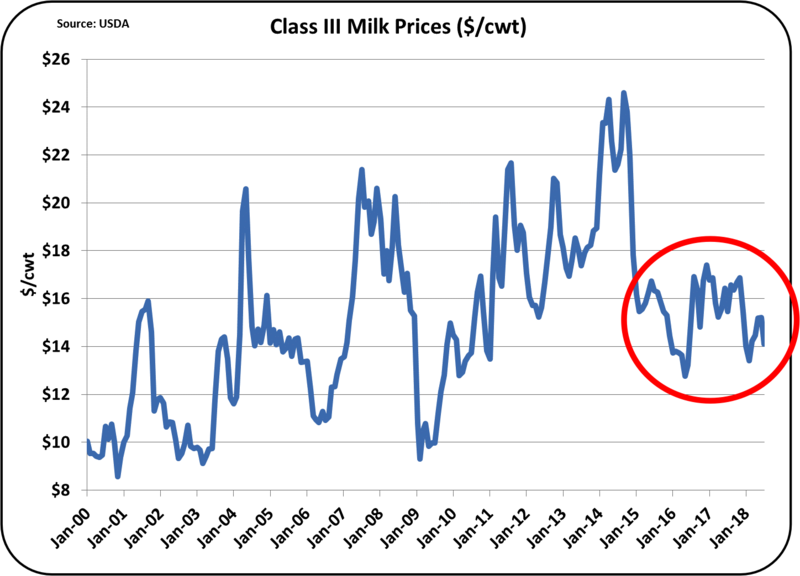 When the dairy industry is in financial turmoil, it is not the processor or retailer who suffers, it is the producer. The typical producer approach is to cut all expenses and hold on tight. Although no surveys have been done on this, the general consensus is that most producers use the "cut all expenses" approach in tough times. All of the results displayed above increase revenue more than the cost of feeding a diet balanced for amino acids. There have been articles by other well-respected nutritionists on this subject with the same advice. Precise changes can produce better results than a shotgun blast of "reduce all expenses." 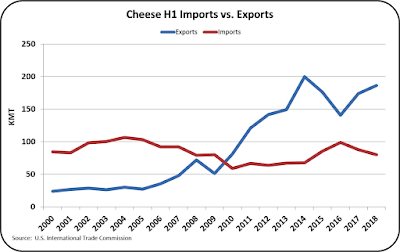 Cheese Exports Improve - Is it Enough? Export/import data for the first half of 2018 is now available. In summary, Nonfat Dry Milk (NDM) exports are up and they are setting record highs, cheese exports are up, but are still not at record levels, and butter exports are also up, but they are small and not near record levels. 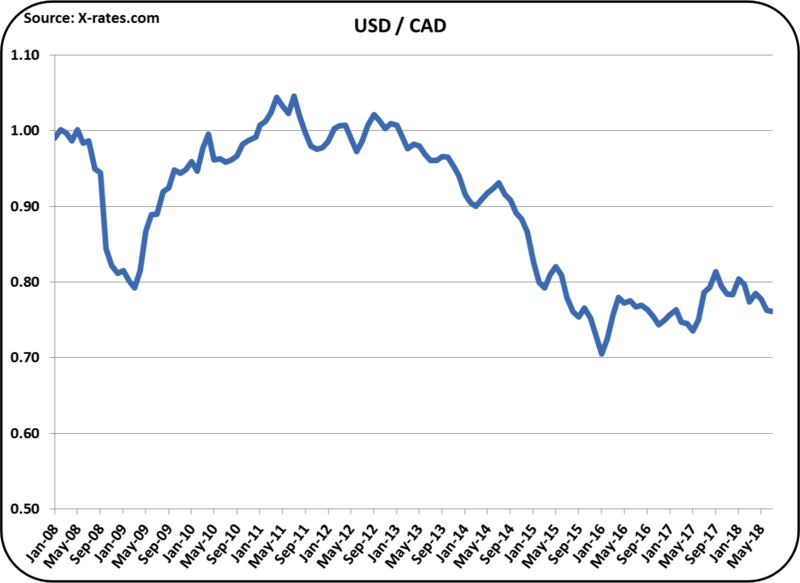 In this post, the first half export/import data will be reviewed comparing the 2018 data from the first half of the year to the data for the first half for the years 2000 to 2018. The first to be reviewed will be NDM as it is the star performer of dairy exports. 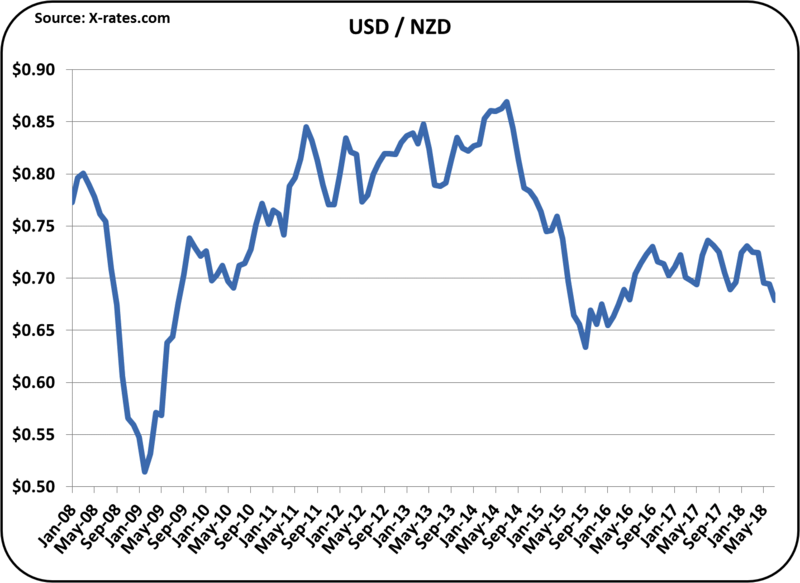 As seen in Chart I, exports are at extreme record levels. This is the second year of major export increases and the 2018 increases are up over 20% from 2017. Imports are pretty steady compared to the last four years. 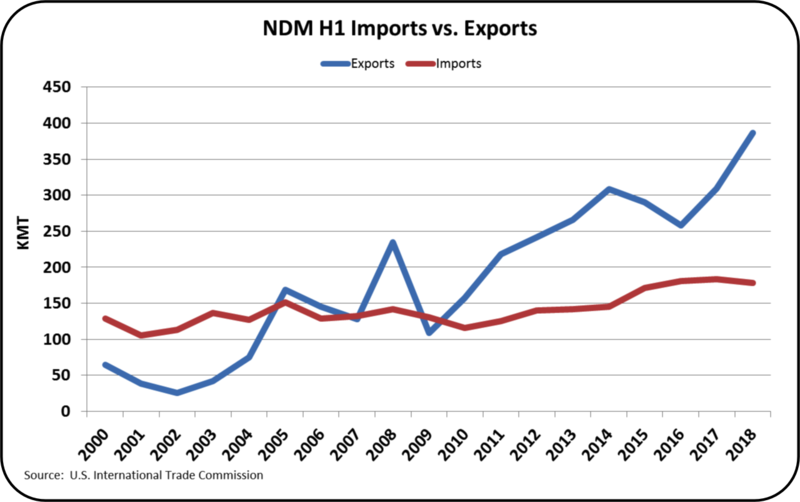 The gains in NDM exports are an amazing achievement. The NDM exports are going primarily to Mexico with some nice gains in Indonesia and Vietnam. 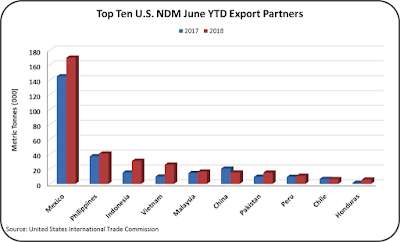 NDM sales to Mexico are not in danger of tariffs as the retaliatory tariffs levied by Mexico are only on one dairy product, cheese. 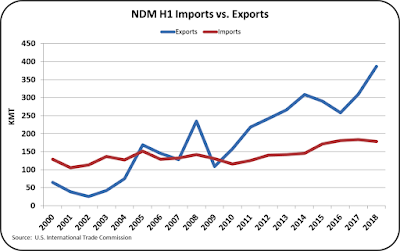 While prices are low, there seems to be momentum for further NDM export increases. 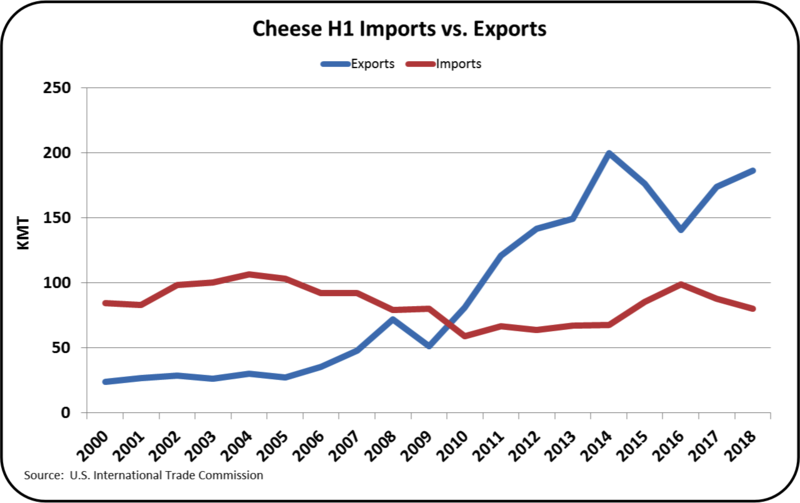 Chart III shows the H1 exports for cheese. The good news is that cheese exports are increasing and imports are decreasing. 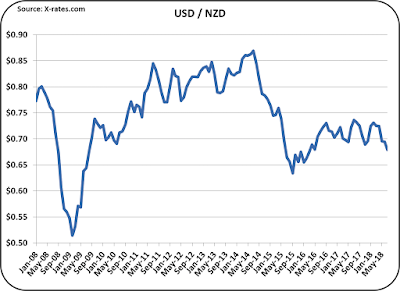 However, exports have not reached the level of 2014. 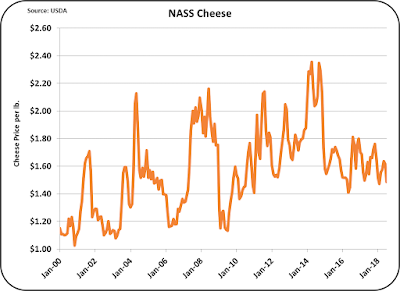 To help reduce cheese inventories, exports will have to reach heights well above 2014 levels. 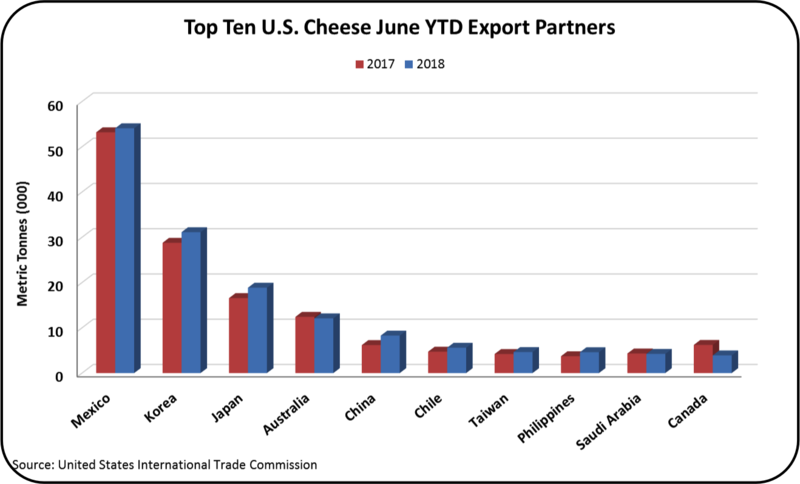 Cheese exports for the first half of 2018 accounted for 6.4% of production vs. 6.1% for the first half of 2017. 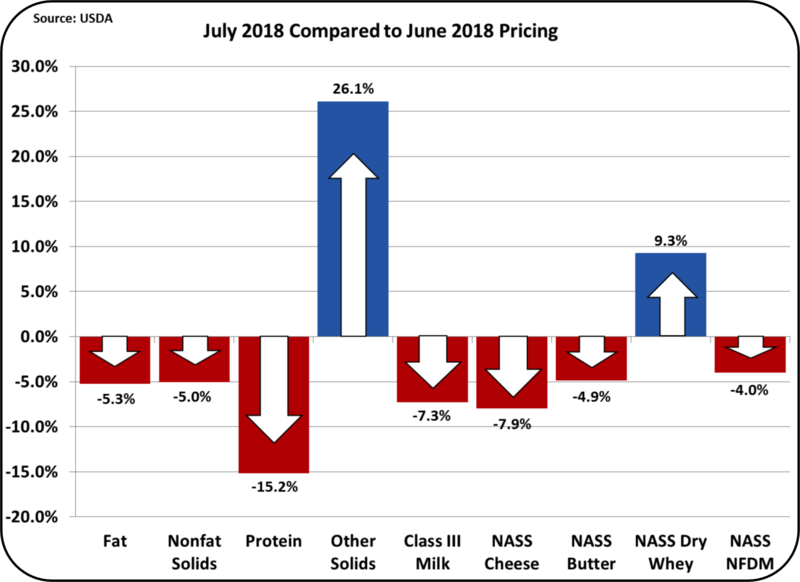 As stated above, NDM exports are up more than 20% by volume for the first half of 2018 vs. the prior year while cheese exports are up only 7% for the same time periods. U.S. Cheese exports show increases for most all major importing countries in the first half of 2018 (Chart IV). 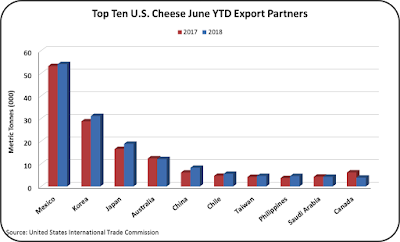 While that shows success, cheese exports are not meeting the needed volumes to match milk and cheese production. 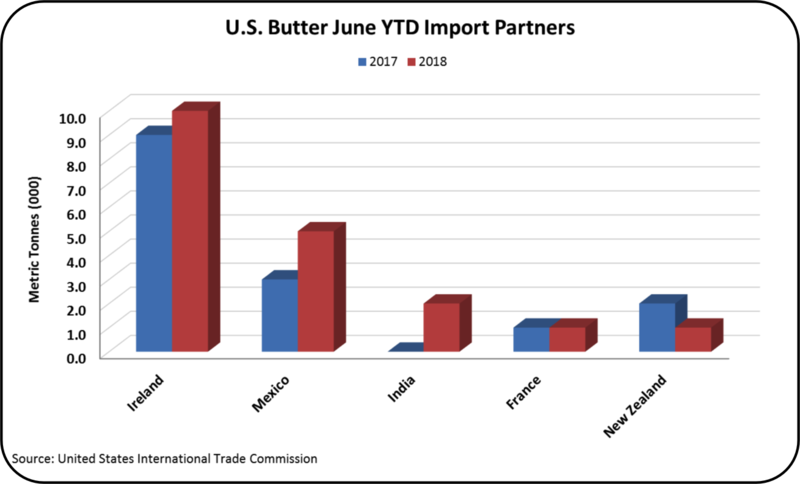 Butter exports remain very small (Chart V). By comparison, NDM (Chart I) show exports approaching 350 KMT per half year, while butter exports are in the range of 25 KMT per half year. 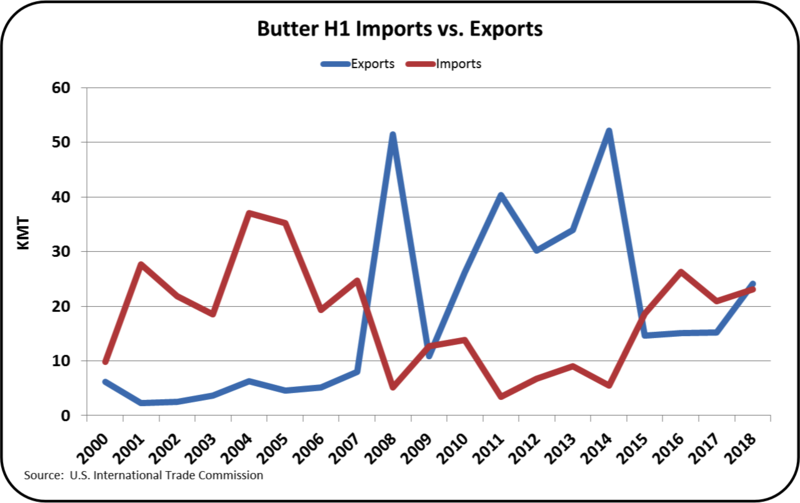 Butter exports and imports are currently pretty equal, so net exports are near zero. The butter exports go primarily to Canada, and in 2018 exports to Mexico have increased significantly. All other butter exports are negligible. 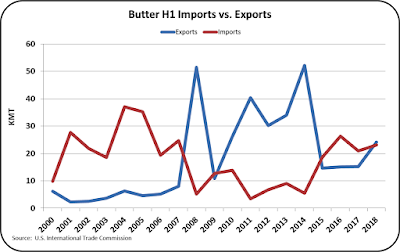 Imports come primarily from Ireland and are the cultured butter marketed as "Irish Butter." This butter is unique and has established a significant following. The first half was a positive period for exports with many gains. However, the gains needed to improve producer prices require more emphasize on cheese exports. 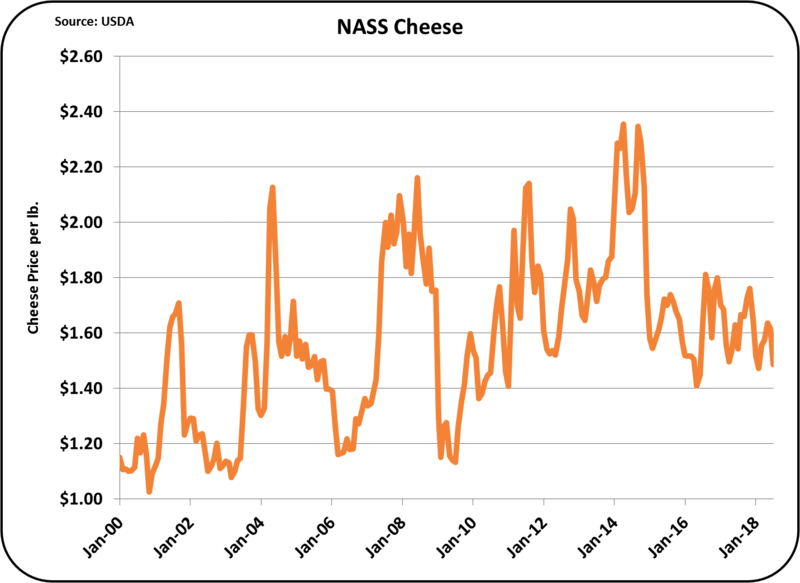 If the gains in cheese exports were up 20% like the gains in NDM are, producer milk prices would be quite a few dollars higher. The goal for cheese exports is clear, but execution is lacking. 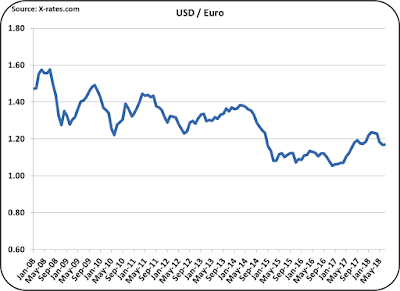 Exchange rates show the USD getting stronger. This is not good for exports. 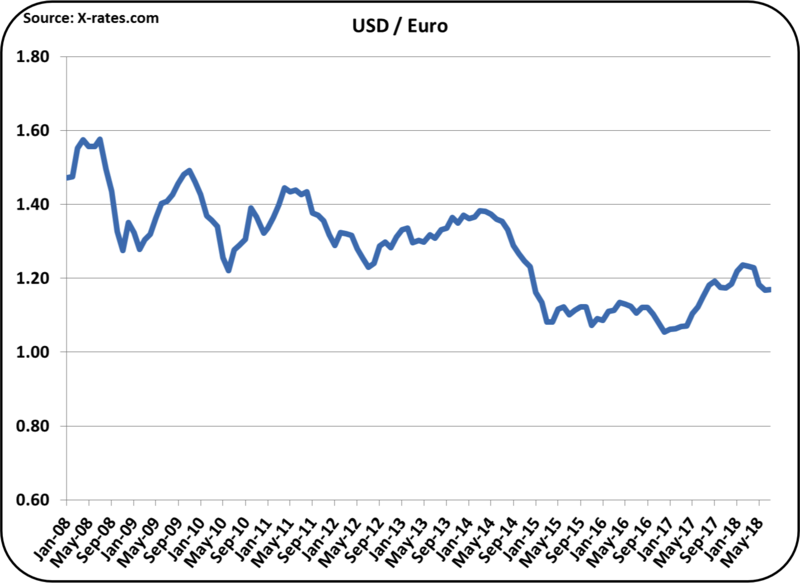 A stronger USD makes U.S. products less competitive in the international markets. 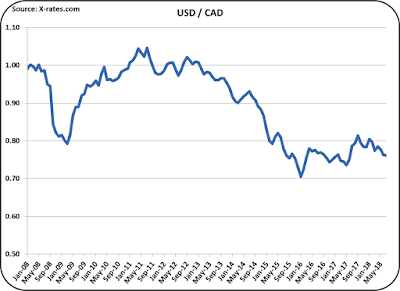 On the graphs below, three out of four of the charts, show the USD getting stronger. 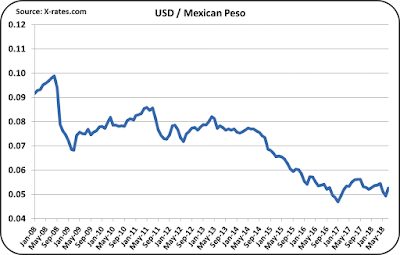 The Mexican peso is the only currency that is getting stronger against the USD and that increase is only for the last monrh. Because Mexico is the largest market for U.S. dairy products, the stronger Mexican peso will help U.S. dairy exports. The 25% Mexican tariff on U.S. cheese will probably be short lived. It should be noted that cheeses imported into Mexico from other countries also carry a 25% tariff. 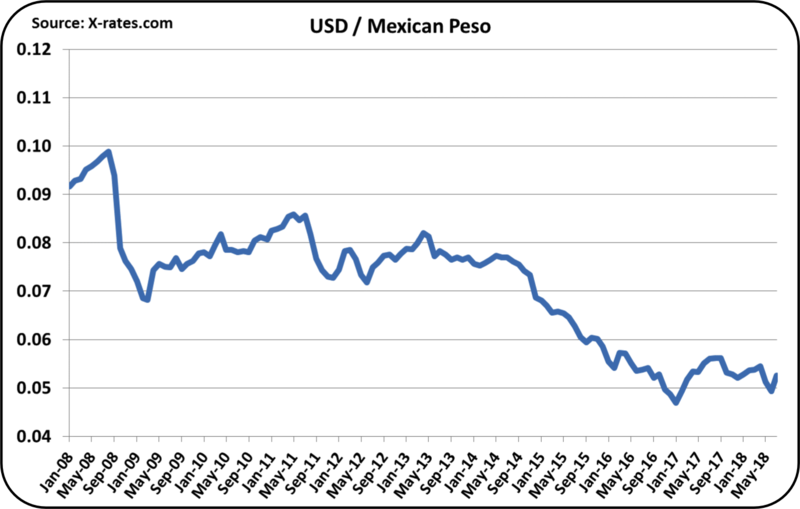 With other exporting countries dealing with a 25% tariff on cheese imports to Mexico, and a weaker USD vs. the Peso, the current impact of a 25% tariff on U.S. cheese should be a small issue. It appears that the NAFTA negotiations are going well, so the 25% tariff on cheese will probably be short lived. 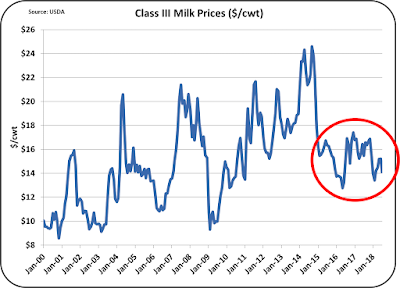 More Low Milk Prices - When will Prices Improve? When California is added as an FMMO, producers in California will not participate in this adjustment. 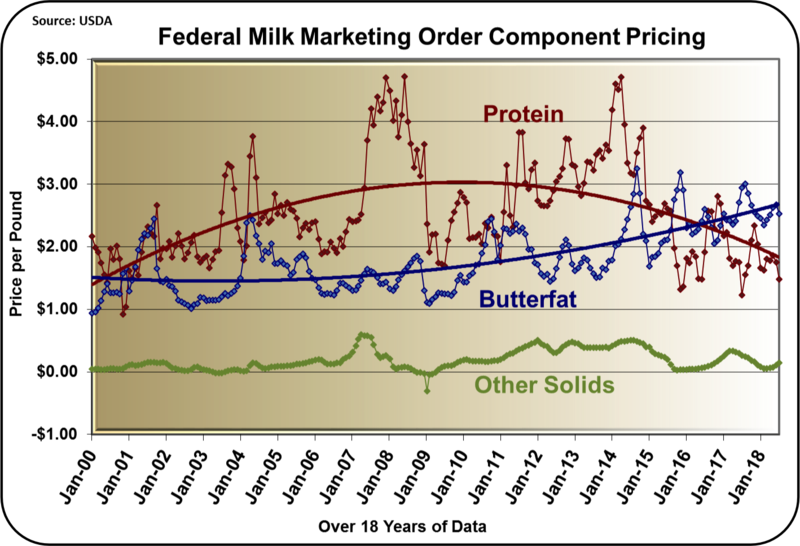 In the "Regulatory Economic Impact of the Final Decision to Establish a California Federal Milk Marketing Order" produced by the Agricultural Marketing Service (AMS), California is consistently compared to the Upper Midwest FMMO. However, there are many differences between the new California FMMO and the Upper Midwest FMMO. Some of these differences was discussed in a recent post to this blog. Differences in the rules governing SCC are discussed in this post. The SCC is primarily a measure of the dead white blood cells that are disposed of through milk secretion. In a sense, the white blood cells are the soldiers fighting infections, primarily mastitis, which have died in the battle. High SCCs in milk are an indication of milk from a sick cow. There are SCC limits required for the milk to be Grade A. The Federal limit is 750,000 cells per milliliter, but California has a tighter standard of 600,000 cells per milliliter. The good news is that SCC is consistently and significantly declining, principally through better sanitation efforts. Charts I and II below show this graphically. 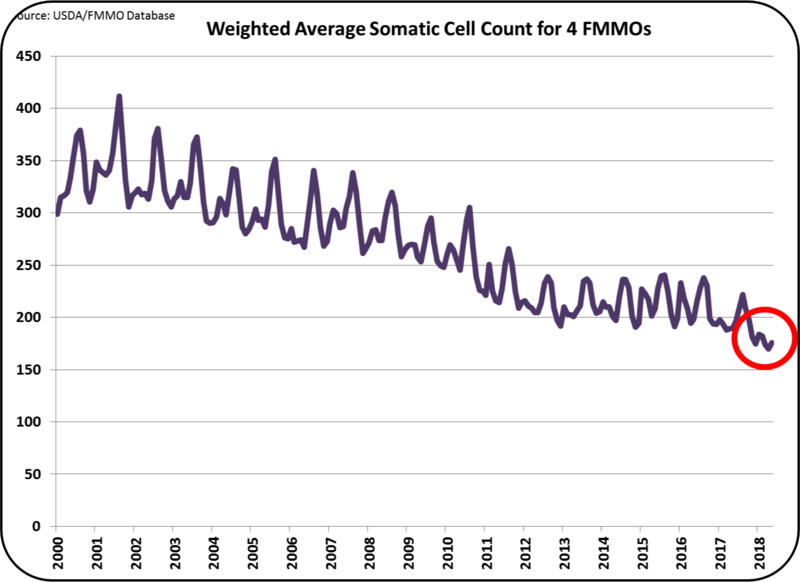 Data from the four FMMOs participating in the SCC adjustment is used to demonstrate the improvement because it is data that has been consistently compiled since the beginning of 2000 and is carefully monitored because money is involved. It is impossible to totally eradicate SCC, and some experts believe that a minimum of 150,000 cells per milliliter is as good as it can get in summary. However, the long-term trends shown in Charts I and II suggest that some improvement below 150,000 is possible. Because there is a limit to what is possible and practical, Charts I and II below will level out at some point. However, It has achieved a point thought impossible by some experts and is still improving. 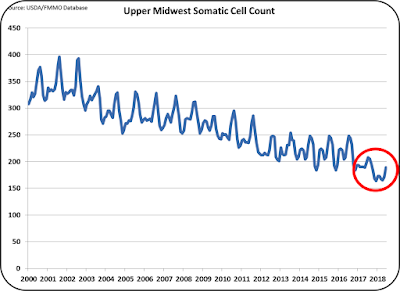 Chart II below shows the SCC data for the Upper Midwest, which was used as a comparison in the AMS paper mentioned above. 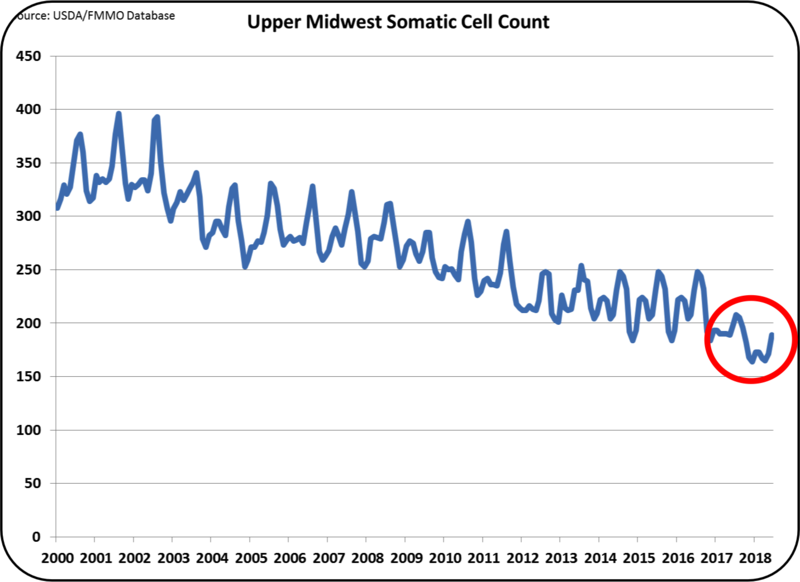 The SCC in Charts I and II show a trend approaching 150,000 cells per milliliter. 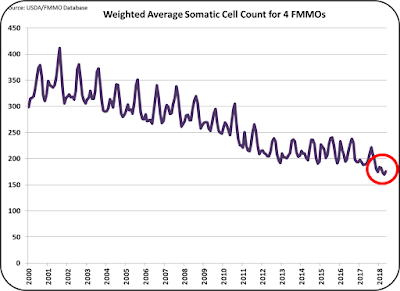 At a level of 200,000 cells per milliliter and at today's depressed cheese prices, a producer receiving a SCC adjustment would realize about $.12/cwt. upward adjustment. 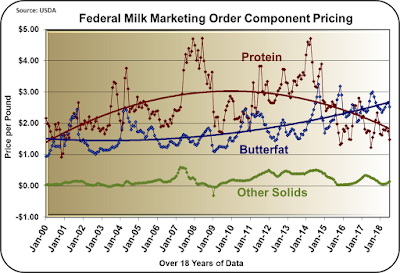 At the peak price for cheese, and at 150,000 cells per milliliter, it would be worth about $.24/cwt. Is this significant? 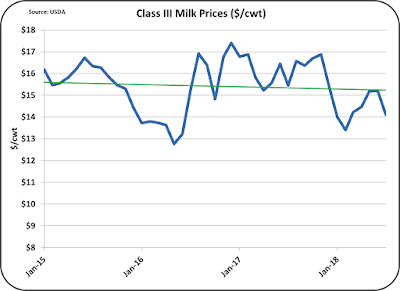 When combined with an adjustment for not having "quota" in California, and a probable negative Producer Price Differential, California non quota milk will be lowest priced milk in the U.S. 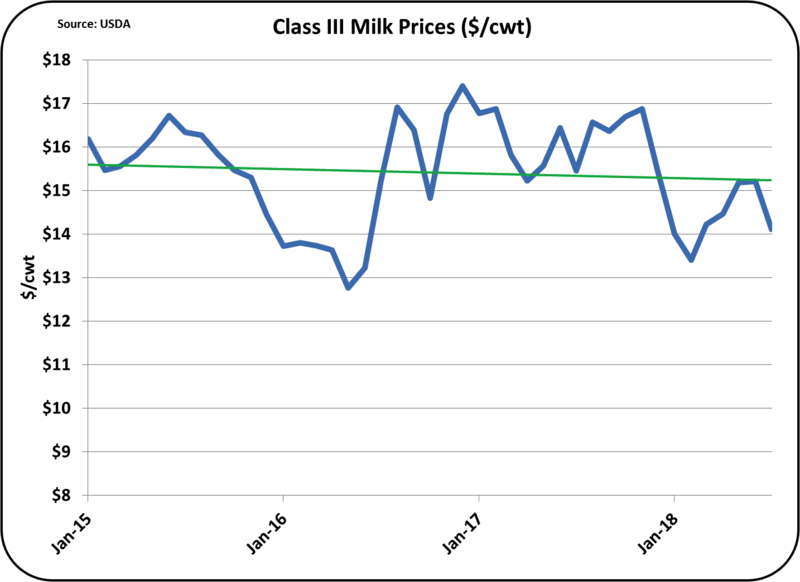 Processors can pay more, if negotiated, but the FMMO pricing sets a minimum and most of California's milk will have the lowest price in the U.S. In the Upper Midwest, there are frequently bonuses for higher milk protein levels because the protein is needed for efficient cheese making. When California is an FMMO, there will almost certainly be bonuses above the FMMO minimum price, but that FMMO price less the CDFA non quota adjustment will be a low starting point. Why is there no SCC adjustment for California when it becomes a FMMO? In response to an inquiry to AMS they simply stated that "(SCC adjustment) was not proposed by any of the proponents and therefore it was not considered by the USDA." The other difference in SCC rules that differentiate California from the rest of the U.S. is the limit for being classified as Grade A milk. As stated above, to be accepted as Grade A milk, the U.S. standard requires a SCC of less than 750,000 cells per milliliter. California has a slightly tighter standard of 600,000 cells per milliliter. While today's levels of SCC are well below either of these, it does make the California standard slightly more difficult to qualify as Grade A. Future posts will continue to analyze the new California FMMO.